Thinking of doing some traveling this summer? If you are anything like me, any chance to hit the open road is definitely taken advantage of. I have already taken a cross-country train ride this year along with a few long driving trips, and I have plans for many more in 2011. And although I have many favorite tools that I always have with me on my trips (like my trust radar detector! ), one of the most important ones is my iPhone. Between finding a place to eat, making phone calls, GPS directions, and streaming Pandora, it’s definitely at the top of any packing list I put together. With that in mind, I wanted to assemble a Top 10 of free travel-oriented apps that I either currently use or have used in the past, in hopes that it can help out other iPhone owners during your travels this year. Each link opens up the app in the iTunes app store. Gas Buddy – If you’re on a road trip you’re eventually going to have to stop for gas, right? Well, if you aren’t in the middle of nowhere (where I usually find myself), Gas Buddy can help you choose which gas station to buy your gas from based on your location and the price of the gas for sale. A must-have. TripIt – A comprehensive travel organizer, TripIt keeps your entire itinerary at the ready whether you’re online, offline or in airplane mode. Brilliant, really. Hotel Tonight – Need a hotel room today?Hotel Tonight offers same-day exclusive deals on rooms in several major U.S. cities. You can book a room up until 2 am, so even after driving 16 hours you shouldn’t have any problem finding a place to lay down for a bit. SitOrSquat – Chances are you have needed to find a bathroom before in an unfamiliar area, and that’s where SitOrSquat comes in handy. By entering a zip code, city, or just an intersection, you can find a clean bathroom to do your business in. Yelp – Hands-down my favorite app on my iPhone right now. Find places to eat, hotels to stay in, businesses to visit, or just things to do in most cities. An absolute must-have. Trip Advisor – Another review site like Yelp, I have used Trip Advisor to select hotels to stay in many times over. 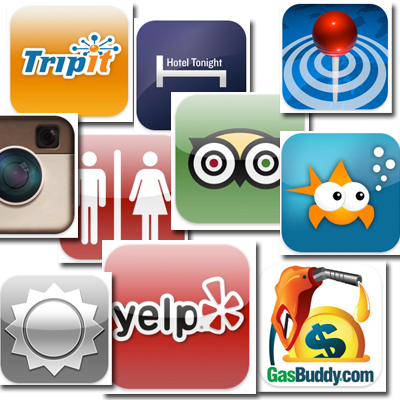 The reviews of other users is an invaluable tool when searching for a place to stay. AroundMe – Hanging out somewhere you have never been before? Check out AroundMe, which can tell you immediately where the closest bank, gas station, hospital, or grocery store is in relation to wherever you are. AccuWeather – This is my favorite weather app and the one I use every day. While it’s great for telling me the weather at my house, it’s very handy for looking up the weather along the routes of my trips. Goby – Goby helps you find things to do, no matter where you are. Stuck with the kids in a strange city? Find something to do just by clicking a few buttons, from outdoor adventures to live events. Instagram – This is the second-most used app on my phone right now. Handy for taking pictures and sharing them online with just a click or two, Instagram also lets you add creative filters which make your pictures stand out even more. Everyone loves seeing pictures from your trip, and this makes it even easier to share them. What are some of your favorite travel apps that you can recommend? Please be sure to let us know, as I am always on the lookout for new ways to take advantage of my iPhone on my trips!